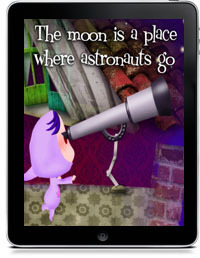 This launch of the Wilsons’ Tiny Tourists app series is an excellent first step to the world. Here is a little slice of the Netherlands, with enough to give a taste of what more lies ahead of any traveler who cares to make the trip, presented in either English or Dutch. There is a page of history that touches on the ruling family and Dutch colonialism and little “fun facts” in a pop-up strip at the bottom—about canals, tulips, windmills and so on. These do not intrude uninvited upon the storyline of Little Lamb’s bike ride from her van Gogh–esque farm to Amsterdam. The interaction with the application is kept to a minimum; what’s there is sweet and unpredictable (touch a cloud, and it may scud; touch another cloud, and it may vaporize). The artwork of the 25 panels has sophisticated, childlike line and color that avoid busyness. The emphasis is on the windmills, tulips, wooden shoes, Dutch tiles (used as a jigsaw puzzle), houseboats and an atmospheric canal at night fronted by old gabled houses. And Little Lamb’s bicycle squeaks most adorably.